1 bedroom - close to beach & centre - Wifi + linen included - optional AC + pkg. Tenants wished: families and responsible couples. 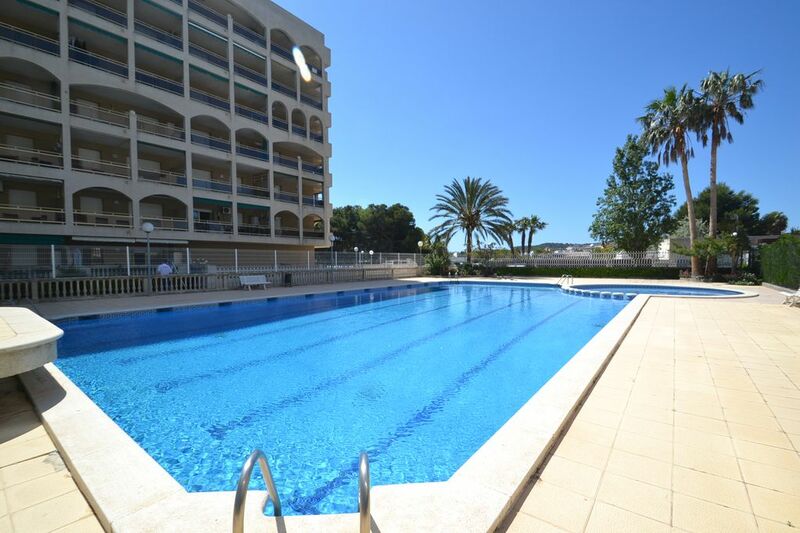 Pleasant apartment with air conditioning, in a pleasant family residence with big secure swimming pool, close to both the beach and centre La Pineda's seaside resort. This apartment, on the first floor of the residence (elevator), is bright, functional and comfortably equipped to host up to 4 people. It counts with a big independent bedroom with double bed, storage closet and air conditioning (optional service), a complete bathroom with bathtub, an open-plan kitchen opening up to a beautiful living room with sofa-bed, television and direct access, using wide picture windows, to the covered and furnished terrace (table + chairs + 2 sun beds and a sun shade) with views onto the exterior of the residence. The kitchen has been completely renovated, in accordance with actual trends, and is well equipped with much storage furnishing, a complete range of household appliances (big fridge-freezer, oven, microwave, vitroceramic cooktop, coffee maker, etc …) as well as a washing-machine and makes available to you a dining area with a table and chairs. Very well maintained and fitted out to grant a comfortable stay, with fans, storage closets and cabinets, flat screen television, outdoor furniture, etc … , it includes an unlimited Wifi Internet connection, a satellite with a few international channels, as well as the complete linen (sheets and shower towels). If you wish, a private parking can be rent as an option although it has to be confirmed in advance, and the air conditioning, installed in the bedroom, is an additional optional service which can be selected directly on arrival. The swimming pool of this residence is available from 15/06 to 15/09. The big Aquopolis water park of La Pineda stands just in front of the residence although access is on the beach front. A few minutes drive stands Salou, Costa Dorada's tourist capital, with its long beaches, famous maritime promenades with stores, light colorful fountains, sports facilities, children playgrounds, etc … as well as the unmissable Port Aventura theme park with the Ferrari Land, inaugurated last summer. This property is ideally located for a couple of family holiday, close to the beach, to all facilities, yet in a quiet residence. Catalonia applies a holiday tax, included in the price of this property. La Pineda is a family seaside resort standing about 100 kms. South from Barcelona, 5 kms from Tarragona, known for its rich cultural patrimony, classified at the UNESCO and 2 kms North from Salou. La Pineda goes all along a large fine sand beach with maritime promenade, shops, restaurants, beach huts, children playground as well as high pine trees and fountains. It is very much appreciated by families and offers many activities, suitable for the young and not-so-young, such as the Aquopolis water park, a dolphinarium, a modern Spa and fitness centre, sports and leisure activities, bars, restaurants, nightclubs, shops, children playgrounds, etc... as well as the famous Pacha nightclub. .
Only 5 minutes from there stands Salou and its famous Port Aventura theme park, one of the most important in Europe, with the Ferrari Land, inaugurated in 2017. World Vacances Plus is a booking centre between individuals, created in 1998 and installed here on the spot, in Salou. We are here to help you with finding a holiday rental which corresponds exactly to what you're looking for, depending on your enquiry criteria, expectations and needs, and follow you through all the steps of your booking, in English, until key collection; for this property, it will take place at the reception of our booking centre, Via Roma in Salou (about 10 minutes from your property), with a member of our team. Being here on the spot, we personally know each of our properties and their owners and can therefore perfectly answer all your questions. - well maintained and very functional apartment - 1 big bedroom with closet and air conditioning as well as a double sofa-bed in the living room : comfortable for 4 people. - Wifi and linen included. - Air conditioning and parking available as optional services (30 Euros per week and 50 Euros per week). - Family residence where you'll enjoy, with your family, a big community swimming pool with children's area, fenced. - Close to La Pineda's main beach, to its beautiful maritime promenade and to the resort's centre as well as to the Aquopolis water park. Comfortable property with a large fitted out terrace and complete equipment. Beautiful community swimming pool in the residence which stands close to La Pineda's beach and long maritime promenade. Close to the Aquopolis water park, you easily get to the Port Aventura theme park - many leisure activities available in La Pineda and the neighbour seaside resorts. Complete bathroom with a bathtub. Optional air conditioning: 30 Euros per week - device in the bedroom. The linen is now provided to you for free (sheets and shower towels). Optional private parking spot : 50 Euros per week, to be confirmed in advance. An unlimited Internet connection is included. In this apartment, there is a pleasant living room with open-plan kitchen, sofa-bed and a direct access to the beautiful furnished terrace. There is an actual and completely renovated open-plan kitchen, equipped with a complete range of household appliances, much storage and a dining area. A satellite device is now provided in this apartment with some international channels. Furnished terrace with table, chairs, sun shade, sun beds and views onto the exterior of the residence. The residence is equipped with elevators, ramps, the access to the swimming pool is flat but the apartments have doors and corridors with standard width. There is a large fenced swimming pool in the Turquesa residence, with a children's area and limited access with a magnet. Totally equipped, bright and colorful, this holiday rental has been thought in order that you feel like home. Linen and Wifi included. Optional air conditioning : 30 Euros per week. Optional private parking spot: 50 Euros per week. La Pineda is a seaside resort suitable for families, it is 100 Km from Barcelona, 2Km from Salou and 5Km from Tarragona, a place known for its cultural patrimony. There are several activities available such as the water park Aquopolis, a dolphinarium, a spa and fitness center, bars, restaurants, night clubs, there is a large sand beach. Salou and its famous theme park Port Aventura , one of the biggest in Europe is only at 5 minutes from La Pineda. Hints and tips will all be sent to you before your arrival so that you can get organized. Access by train: About 5 kms. from Salou's train station, 10 kms from Tarragona's central station and 20 kms from Camp de Tarragona's HST station. Access by plane: About 13 kms. from Reus' airport and 88 kms. from Barcelona's airport.